The tone of the voice emanating from beneath Paul Sises black-mesh mask is in stunning contrast to his actual words. Attack, he says softly, and waits until the students sabre taps his mask: just where his forehead would be. Again, says Sise. Check your guard. And then: Beat in seconde  second position, blade down  and they engage. If any sport can be called beautiful, fencing is it. The combination of grace, strength, and form; the contestants in their fitted whites, or dueling jackets; the metallic glint and click of blades. Sise 00G (he finished his masters in geology last year) gliding forward and back on the six-foot wide, 45-foot long strip that is the fencers field of action, its limited space emblematic of the ideal of standing ones ground. Sophomore Sandy Lubben, her off-hand held behind her back, has  whether shes advancing or retreating  a wide smile visible behind the shadows of her mask. Oh, are you kidding? she says when Sise tells her their lesson is almost finished. I could go all night. Limber, breathing evenly, she looks as if she could, too. At UMass, fencing is a club sport, and one of the rare ones with little if any precursor at the high-school level. While a few members join with a year or more of experience, the vast majority have none, says womens coach and former grad student Brad Baker. In fact, 90 percent of UMasss 40 current fencers have gone through the grueling novice program within the past two years, making them a very green team. Swords are cool, at least in the hands of the skilled and nimble. The three coaches here in a Totman Gym practice room tonight  Sise, Baker, and novice coach Renee Coombs 99, who teaches physics at Westfield High  watch the team practice warm-ups. Positions are held and broken, held again. Once the dueling starts, they coach from the sidelines, critiquing, pulling students out for individual lessons. The magic words  Guard; ready; fence  are called out over and over by the director, fencings term for referee. Theres a reason for the comparison: Classical dance owes much of its form to the 800-year-old sport of swordplay. 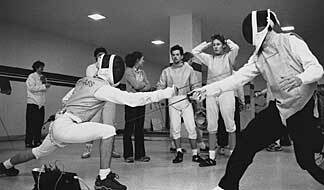 Some positions, such as basic position in fencing and first position in ballet, are identical. Fencing has existed at UMass, either as a club sport or as part of military training, for 125 years, offering competition against such schools as Boston College, Army, and Harvard. As do other club sports at UMass, the team runs on a tight budget. Away meets are a challenge, but as sabreist Lubben says, Someone will have an aunt out there, we sleep on the floor, eat lots and lots of pasta. Another trick is to make the equipment last: Dueling whites can run close to $500 new, with weapon and mask adding $200 to the bill. The canvas whites worn by the UMass team have been passed along, year to year, cleaned and cleaned again. When students don their whites and masks, an interesting phenomenon occurs: Age, race, and gender largely drop away. Its not brute strength, says Coombs. As a female you can do well against men, although the genders are separated in formal competition. Fencing is also a sport you can come back to, adds Coombs. Age is not really an issue  its experience that gets you far. For those who get hooked in college, there are non-collegiate clubs across the country. The UMass coaches compete through the U.S. Fencing Association, in which Sise, for one, has the title of Moniteur d Escrime  instructor of fencing. Fencing alumni and friends remain connected through an associate club, Friends of UMass Fencing. Alumni and friends of fencing are welcome to join the Friends of UMass Fencing (www.fumf.net). Reach chairman Taro Yamashita at 781-642-9888 or at Taro_Yamashita@Yahoo.com.